One of the most deadly phrases used by Christians from time-to-time is, “I (or we) can’t do this.” Author Steve Farrar in his book Battle Ready: Prepare to Be Used by God (Bold Man Of God gives us a beginning list of what not just Christians are up against but everyone faces. “We fight twenty-first–century giants, a diverse tribe of leering, mocking adversaries that threaten our peace, well-being, and very existence. There are giant diseases. There are giant disappointments. There are giant depressions. There are giant addictions. There are giant financial reversals. There are giant career setbacks. There are giant family breakdowns. There are giant personal failures.” (Page 38, David C. Cook, Kindle Edition) It doesn’t take “rocket science” to figure out when facing similar giants the “I can’t do this,” attitude is a death sentence. 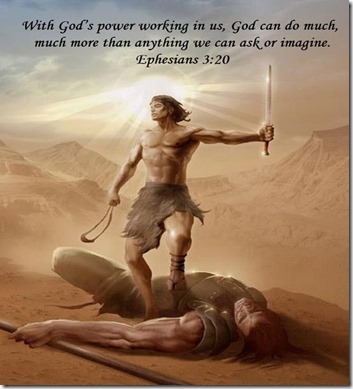 With God’s power working in us, and God’s ability to do much, much more than anything we can ask or imagine we can and will stand up to any and all giants life puts in our path and like Goliath they will fall.